During the chagim (holiday) season, we always feel like we’re running out of time. We go from cooking for one holiday to the next, and even though we have a full week between Rosh Hashana and Yom Kippur this year, it just never feels like enough time. Between all the cooking and prep, decorating our sukkah, catching up on work that we missed over the chagim, we still have to continue on with our everyday lives, and that includes dinner. Dinner needs to be fast and simple, but of course delicious, so that we can have time for all the other million and one things on our checklists — I know my own is never-ending! I created this dinner a few weeks ago, on a night when I had run out of time. It was way past 9 PM before I even began to put this together. No worries, it came out so quick and delicious and was ready in under 20 minutes. I dare say you can even aim for 15 minutes if you read it all the way through and are thoroughly familiar with all the steps to complete before you start. 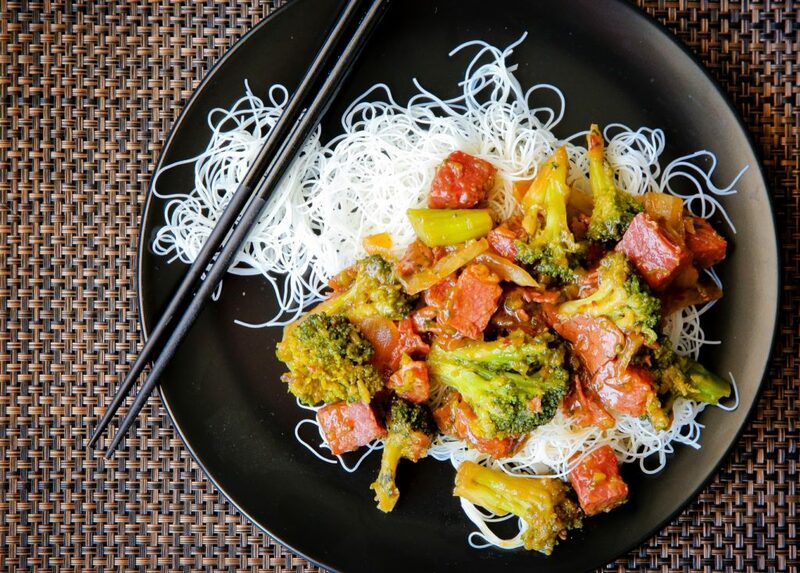 Now, usually you would use a beef like pepper steak or minute steak in a beef and broccoli, but I happened to not have any of that in my freezer, and it actually worked in my favor! If you use a regular beef then you need to worry about tenderizing it, because who wants tough pieces of meat, and that would add time to this dinner that was supposed to be quick. Cubed corned beef was a perfect choice, because it is a cooked meat so all you only want to get a nice golden sear on it and then you’re done! 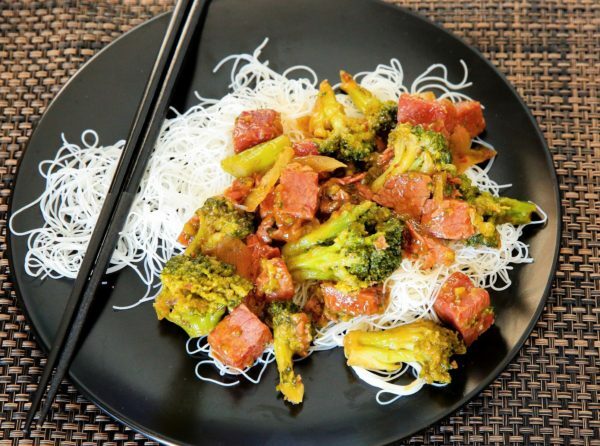 Add in the sauce, cooked broccoli and serve it atop rice noodles, which take around 3 minutes to make, way less than regular pasta. Plus no pot is involved, another score in my book. And you’re done! So, while you’re scrambling to get everything done this holiday season, take 2 minutes to read this recipe through and you’ll be happy you did when you have your next dinner ready in 15 minutes! In a medium bowl, whisk together the soy sauce through the cornstarch and set aside. Place broccoli florets in a microwave-safe bowl. Microwave for around 3-5 minutes until a little tender and bright green. Heat olive oil in a large skillet over medium-high heat. Add in the onion and sauté just until translucent and fragrant. Add in the corned beef cubes and cook until browned, about 4-5 minutes. Stir in soy sauce mixture until slightly thickened, about 3-4 minutes. Add in the broccoli right at the end and mix to coat with sauce. Place rice noodles on a plate and spoon beef and broccoli on top.